Georgia K9 NTC the best Dog Obedience Training and Service Dog Training specialists. Canton Georgia and Edisto Island South Carolina. 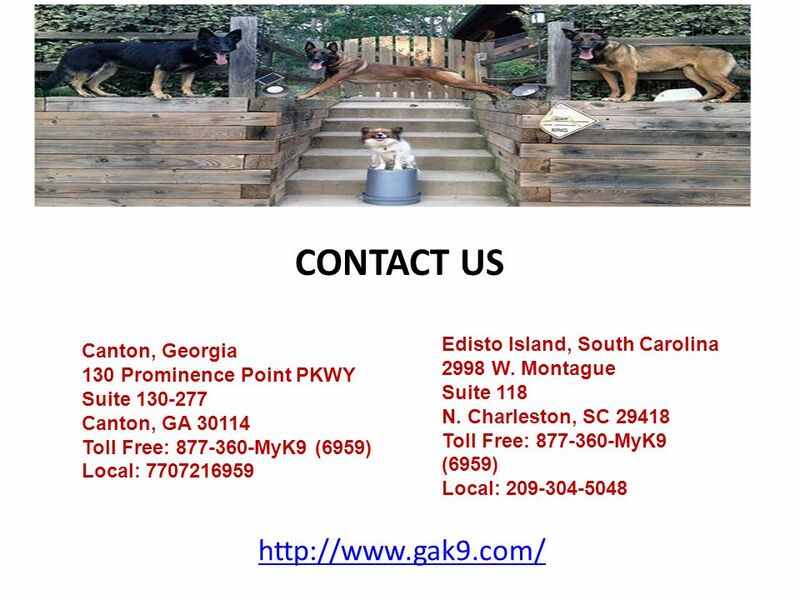 2 http://www.gak9.com/ About Us Georgia K9 National Training Center, the South’s premier K9 training company. 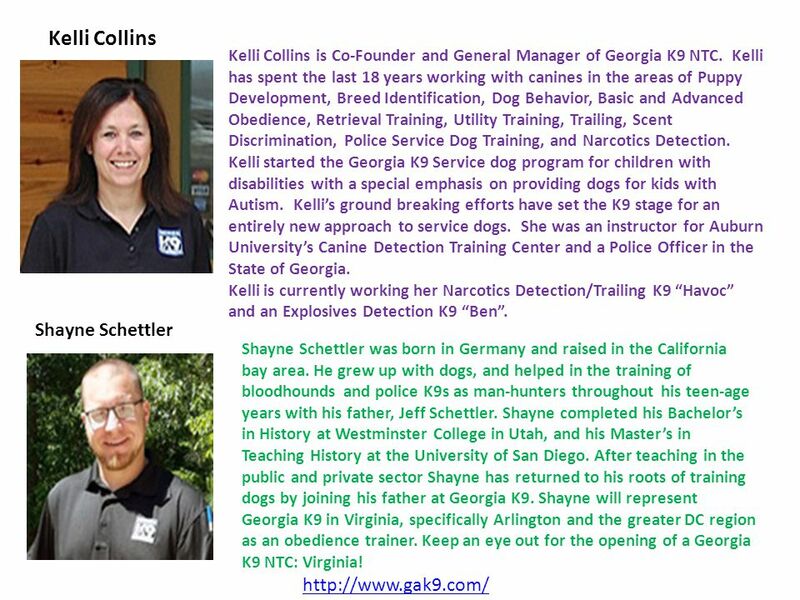 K9 is a partnership of professional K9 trainers from across the United States with a wide range of dog training experience. 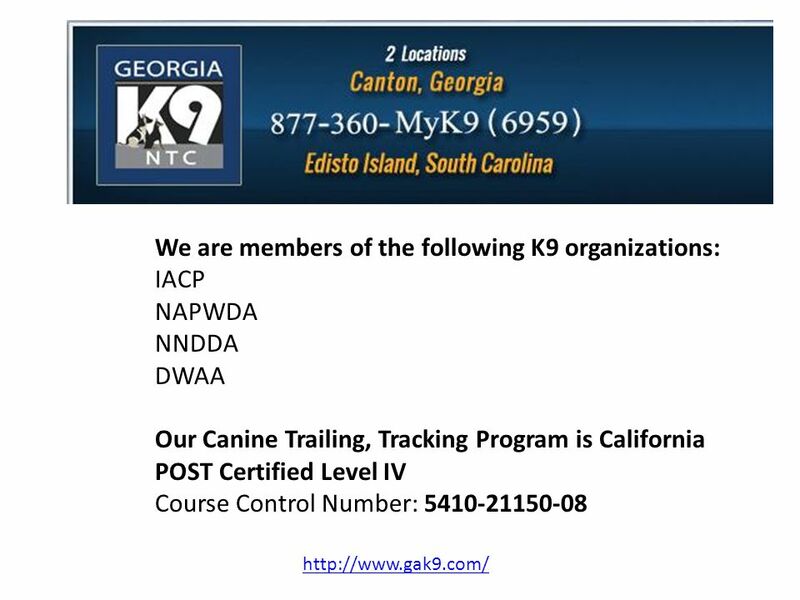 We are nationally certified and work with dogs and handlers throughout the United States. We are specialists in a wide variety of K9 disciplines from dog obedience training, dog tracking and trailing, to canine narcotics detection. 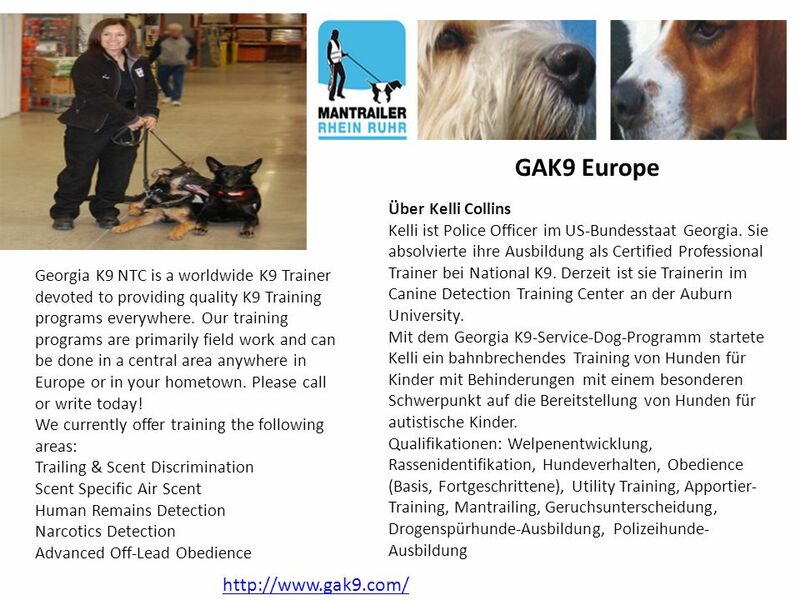 Whatever your needs might be, Georgia K9 has a solution for you! 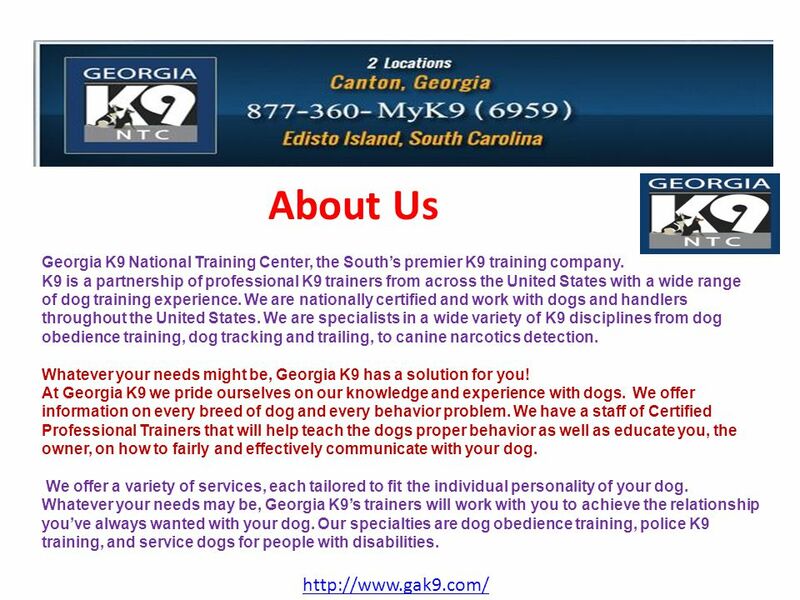 At Georgia K9 we pride ourselves on our knowledge and experience with dogs. We offer information on every breed of dog and every behavior problem. 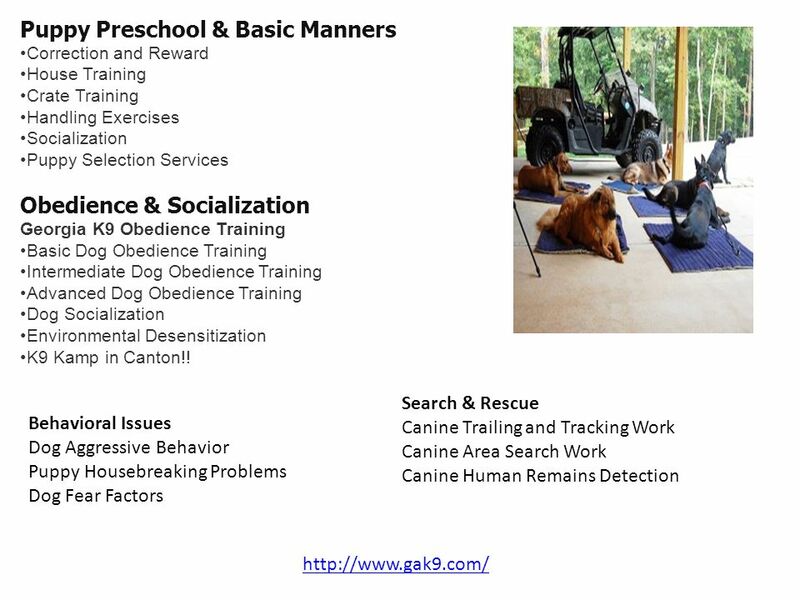 We have a staff of Certified Professional Trainers that will help teach the dogs proper behavior as well as educate you, the owner, on how to fairly and effectively communicate with your dog. We offer a variety of services, each tailored to fit the individual personality of your dog. 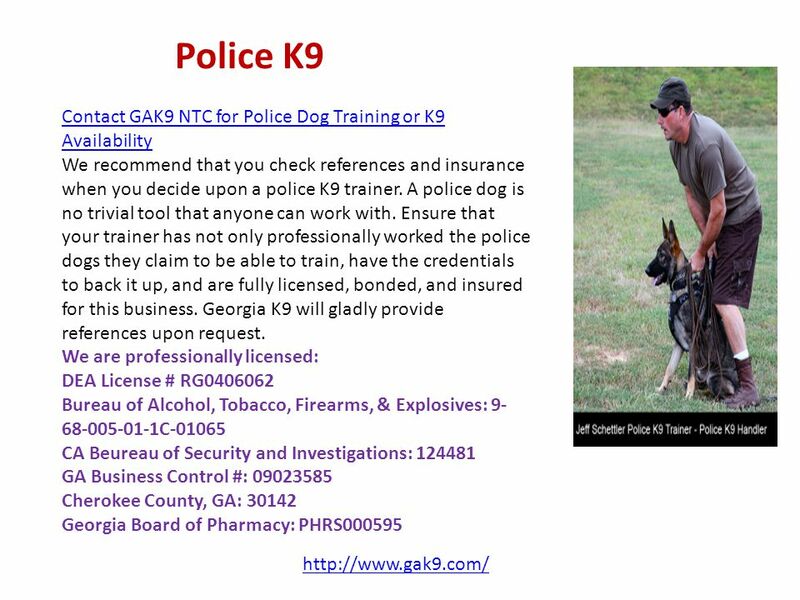 Whatever your needs may be, Georgia K9’s trainers will work with you to achieve the relationship you’ve always wanted with your dog. 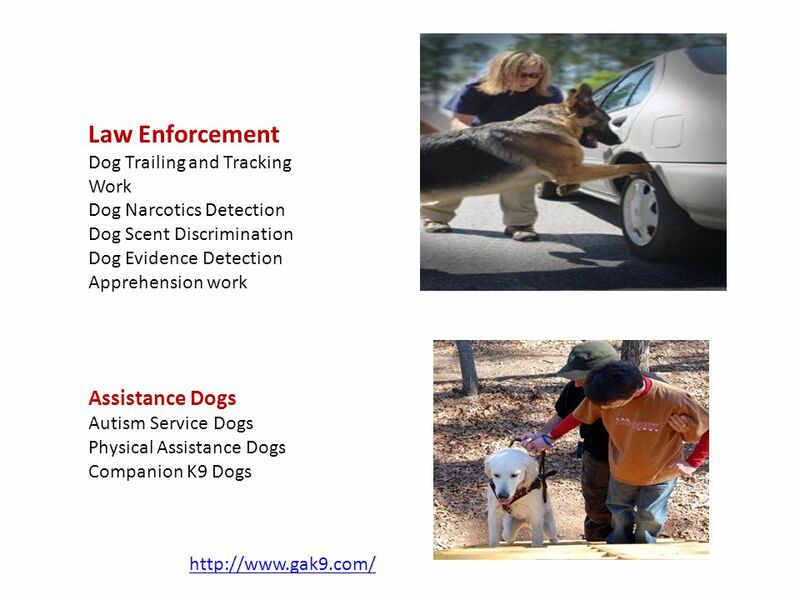 Our specialties are dog obedience training, police K9 training, and service dogs for people with disabilities. 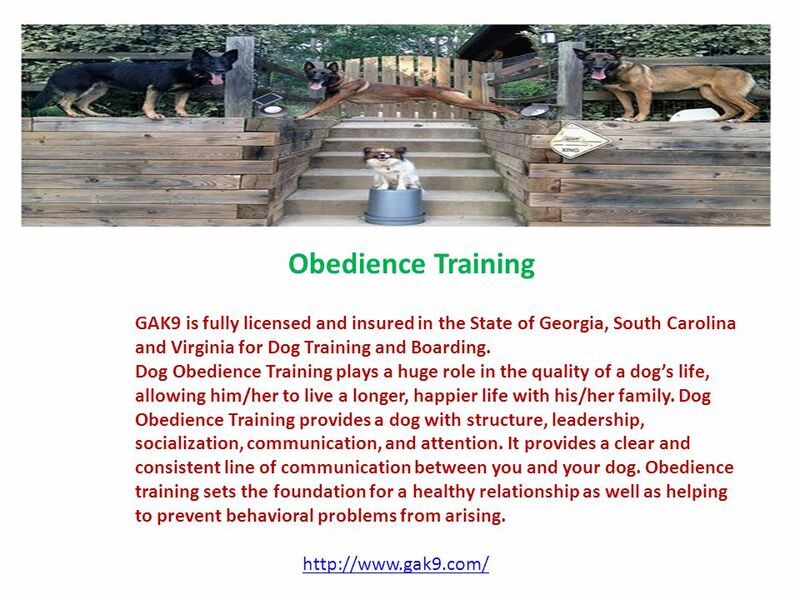 4 http://www.gak9.com/ Obedience Training GAK9 is fully licensed and insured in the State of Georgia, South Carolina and Virginia for Dog Training and Boarding. Dog Obedience Training plays a huge role in the quality of a dog’s life, allowing him/her to live a longer, happier life with his/her family. Dog Obedience Training provides a dog with structure, leadership, socialization, communication, and attention. 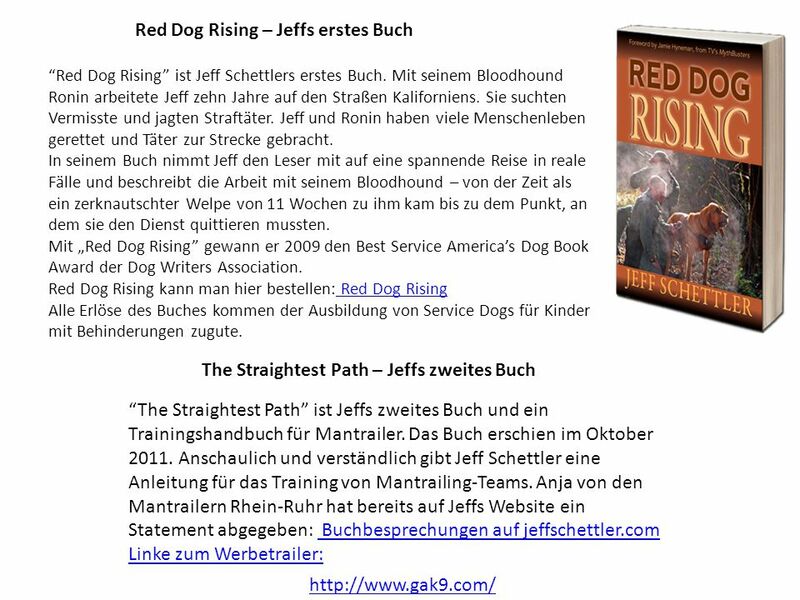 It provides a clear and consistent line of communication between you and your dog. Obedience training sets the foundation for a healthy relationship as well as helping to prevent behavioral problems from arising. 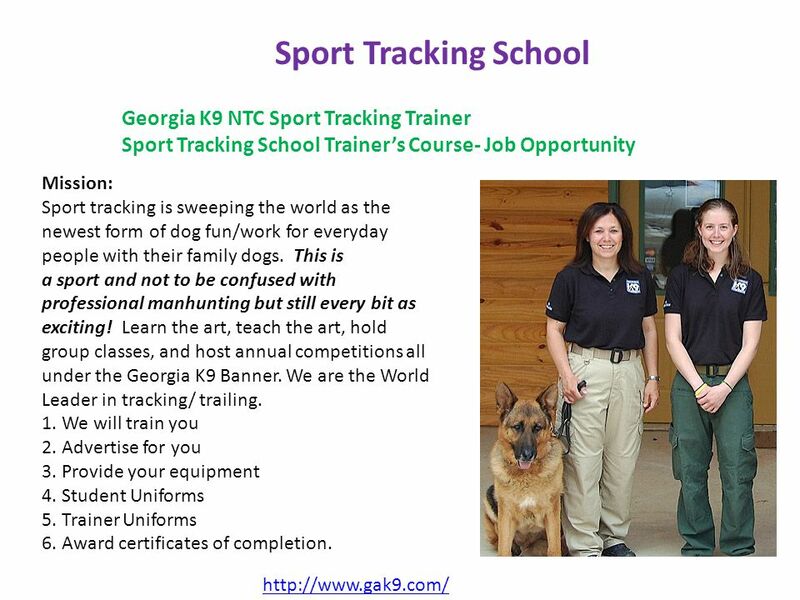 9 http://www.gak9.com/ Sport Tracking School Georgia K9 NTC Sport Tracking Trainer Sport Tracking School Trainer’s Course- Job Opportunity Mission: Sport tracking is sweeping the world as the newest form of dog fun/work for everyday people with their family dogs. This is a sport and not to be confused with professional manhunting but still every bit as exciting! 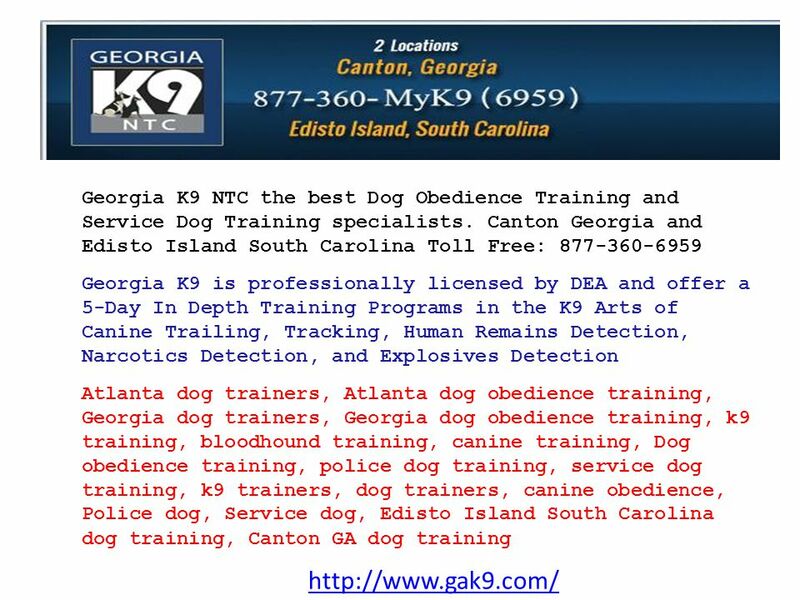 Learn the art, teach the art, hold group classes, and host annual competitions all under the Georgia K9 Banner. We are the World Leader in tracking/ trailing. 1. We will train you 2. Advertise for you 3. Provide your equipment 4. Student Uniforms 5. Trainer Uniforms 6. Award certificates of completion. Herunterladen ppt "Georgia K9 NTC the best Dog Obedience Training and Service Dog Training specialists. Canton Georgia and Edisto Island South Carolina."